We see the situation in Afghanistan all the time on the news, usually only to report that two soldiers have died or that we should just get out now. It’s been a very impersonal experience for those of us on the homefront, a far cry away from the patriotic surges that struck America back in World War II or even the flag-flying defense after 9/11. “Restrepo,” on the other hand, changes all of that. It puts a human face on the conflict in Afghanistan by reminding us that it’s not some sort of digital war like on “Call of Duty.” It’s a real war fought by real people, and the movie probes into their deepest feelings and fears to produce a psychological profile of soldiers fighting in Afghanistan that is truly harrowing. It’s not easy to follow on an event-by-event basis, and for those not familiar with military jargon, it might be a little bit like watching a foreign language film without subtitles. 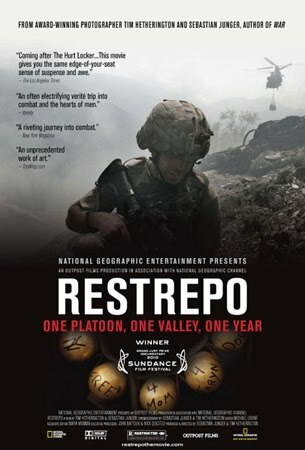 But directors Sebastian Junger and Tim Hertherington make “Restrepo” a movie of emotions, not a movie of events. The movie follows a platoon in the Korangal Valley, one of the most dangerous and volatile regions in Afghanistan, and the toll it takes on them physically and mentally.